You know, some days it's hard to find the spectacular among the ordinary. You really have to look for it. Wind chill of -5. For how many days now? Still trying to deal with the accident of Friday. Frustrating. Nursing a sick teenager. Sad. Trying to get my head around the retreat talks I need to write, the classes I need to plan, and the cooking class I need to get ready for Thursday. Busy. Today felt like a day full of "issues." I could think of all the obstacles and problems that came my way today, list them even. I could choose to focus on everything that felt like it was just too much to handle today. But I realize that my "problems" are completely normal. Ordinary, even. Everybody gets into car crashes and has to deal with insurance companies. Everybody has a sick kid every now and then--some sicker than mine, that's for sure. Everybody is busy to the point that sometimes it gets them down. My problems aren't really problems--they're just the everyday, ordinary part of life. So I had to look. The spectacular is out there, I just had to keep my eyes open to find it. When I did this, I realized that two spectacular things actually happened today. The first was breakfast with one of my dearest friends. As I was driving home, I realized for the umpteenth time how blessed I am to have friends like Amy in my life. Even though I started out our breakfast by complaining about the weather and finished it by complaining about the coffee, she smiled and took it in stride. She knows me, and she knows that this is a hard time of the year for me, as I know it about her. She gets it, and she accepts it. Friends who know you that well and still give you grace are a true blessing. "A robin! 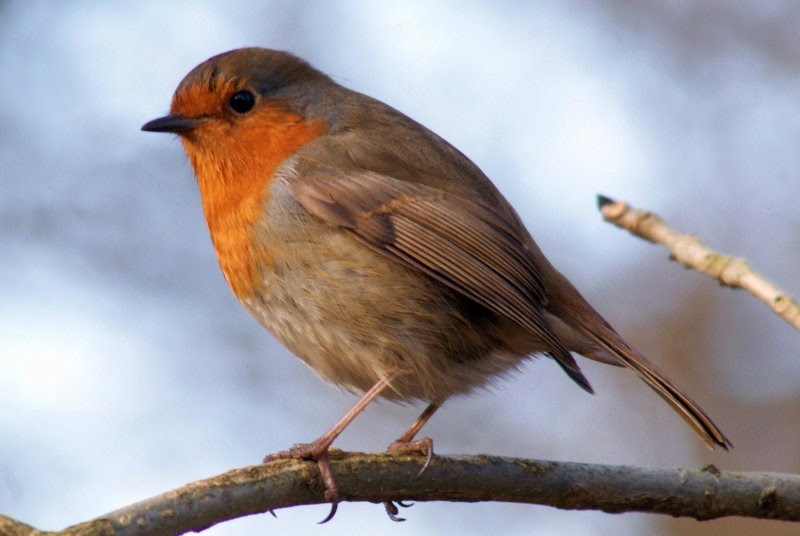 A robin just flew by my window! How could that be?!" You should have heard the excitement in his voice. My dear husband is almost as ready for Spring as I am this year. And so, a spectacular friend and a spectacular sign of spring. It's out there. You just have to look for it. Nice picture, but that's no robin. B.